For over a year now Virtually Connecting has been bringing you conversations from innovative conferences from around the globe. However, sometimes we miss a conversation with someone that we really wanted to talk to. There are lots of reasons for this – it is an uncertain world out there. And we could just let it go but gosh darn’it we live in a technologically advanced point of history – we can still engage these missed connections. Recently, we missed a connection with Laura Gibbs. You may know her better as @OnlineCrsLady or recognize her by the fox icon that she uses across social media. Laura has been teaching online for University of Oklahoma since 2003 in courses that she has developed such as Mythology and Folklore and Epics of India. She teaches in the open using course websites and has her students reflect and communicate using blogs. 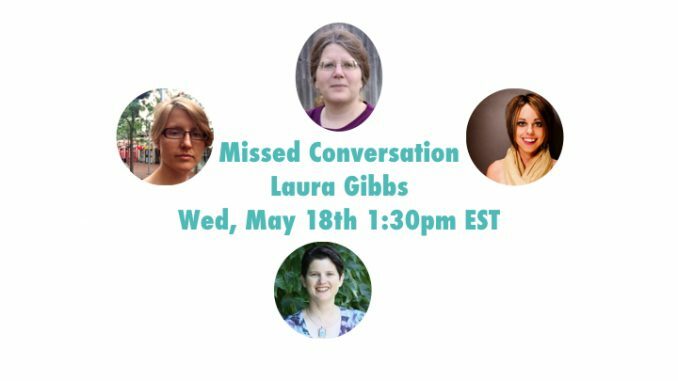 So, this is a bit of an experiment but we are planning a conversation with Laura Gibbs on Wednesday the 18th at 1:30pm EST. So far it will be me (Autumm Caines) and Laura (of course) along with Rebecca Hogue and Lisa Hammershaimb but we have room for others. I’m not exactly sure how this is going to go down considering we don’t have an “onsite buddy” and there is no conference that we are doing this in conjunction with so it is not like there are a bunch of folks who are FOMO about not going. So we’ll see how it goes and who knows maybe when we miss conversations in the future we will do more of these. Just following up as I didn’t hear back from you, sorry to email you again. I noticed your page http://virtuallyconnecting.org/announcements/something-new-missed-conversations-laura-gibbs/ links to http://www.worldtimebuddy.com/. Unfortunately, that site isn’t very accessible for the sight impaired. Would you consider adding a link to a more accessible version like http://www.thetimenow.com which is WCAG 2.0 compatible?